What is it that a brilliant scope ends up giving you? Apart from a great range, it leaves you with a disappointing bank account, to say the least. How about finding a relatively affordable scope that works as well as its more expensive counterparts? If you are the type who makes a good percentage of your buying decision before contacting the sales team, the Bushnell AR Optics 4.5-18×40 review will surely be of paramount significance to you. When you are looking for precision and accuracy, you will need your scope to be versatile. This scope at hand has built its reputation with its versatility with target turrets, side parallax adjustment and 223 BDC reticle so that your rounds are accurately placed on your target up to a distance of 600 yards. The fully multi-coated optics of this scope not only looks good but also makes it more durable. Can accurately place targets up to 600 yards that enhance your precision. Will adapt to your targets and your mission as and when required. This makes it versatile and compatible with your purpose of use at the same time. Designed intelligently to shoot in low-light conditions. Medium to long-range shooting tasks can be efficiently handled by this sighting system. Aluminum alloy and corrosion resistant finish help enhance the durability of the product. The scope can adjust fast enough whenever more precision is required. Parallax adjustment and the option of resetting the zero on the turret make it more popular. The target turrets make audible and clear clicks that allow easier usage. Your eyes will have plenty of space to wiggle around even at 14x power. Why would you buy the Bushnell AR Optics 45-18×40? The features pointed out, and a concluding statement with this Bushnell AR Optics 45-18×40 review does not do justice to the product that is being reviewed. There needs to be a more detailed analysis of what and how the product serves your purpose better than the others available in the market. Listed below are its features discussed at length to assist you in your decision. A sighting system needs to be able to withstand unfavorable weather conditions. It also needs to be durable enough to last so that it can justify its price. 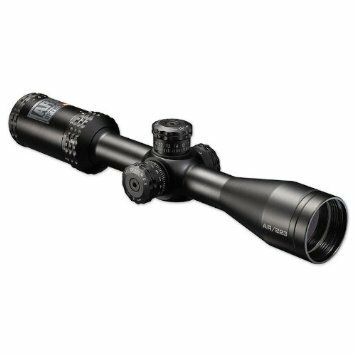 This scope’s housing is made of aluminum alloy and has a matte-black anodized finish that keeps it scratch-proof and corrosion-resistant. The scope is also filled with nitrogen and O-ring sealed to keep it safe from water or fog. This feature enhances its performance in extreme weather conditions and enhances its durability. 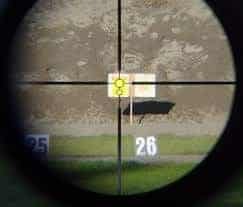 A scope needs to give you accuracy and precision of your target and your moves. The Bushnell AR Optics 45-18×40 has target turrets that will not let you miss your target. It will give you precise adjustments, to say the least. 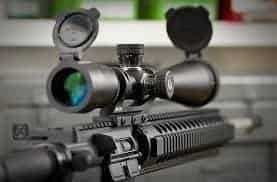 The scope also features a reticle that is calibre-specified to be peerlessly accurate in every round that you deliver. The efficiency of a scope is not limited to how it performs when used in favorable conditions and surroundings. The Bushnell AR Optics 45-18×40 has been designed for rough terrains and unfavorable conditions to be used in. The O-ring is sealed to ensure that no dust or moisture can enter the optics. All scope of internal moisture is removed by filling it with nitrogen. 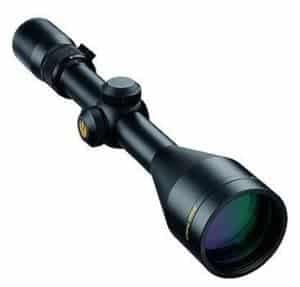 Aluminum alloy is highly durable, and that is what makes the exteriors of this scope. The inside of the scope is sealed and given an anodize-finish to keep it safe from the elements of Nature. It is not limited to being just scratch-proof but also goes on to be rustproof. The designers of this scope have paid attention to detail in the sense that it has been created to give you reliable options. Its zoom range is versatile with a large objective and multicoated optics for brighter and clear images, even in low-light conditions. This especially comes in handy when medium to long-range shooting tasks are required to be completed in unfavorable weather conditions. The target turrets can be adjusted with audible clear clicks that make it very convenient to work with. Target adjustment to zero is as easy as removing the screw, popping off the turrets and lining up the ‘0’ with your own zero mark. The adjustments after this step are easier than you can imagine. Simply dialing back to ‘0’ again will get you to back to where you had started. What keeps new buyers and users happy with the product is the price at which you get it for. You will definitely recommend it to people you know, simply because of the price it is available. For a scope that offers such crisp and bright images and also has unique features to offer, this is definitely a good deal. Nitrogen-filled interiors and sealed O-ring keep moisture, dust, and dirt away. Can be used on rough terrains and in inclement weather conditions. Versatile zoom range allows you to have bright images even in low-light conditions. Side parallax adjustment has target turrets that can be reset to zero in the blink of an eye. The focus eyepiece is fast enough to give you maximum precision and reliability. Rustproof and scratch-proof interiors as well as exteriors. Elevation turrets and exposed windage ensure that quick adjustment is made when there is a need for precision. The eyepiece tube has a rather large diameter that could be aesthetically less pleasing. At the lowest magnification, there is enough eye relief, but a higher magnification could make your eyes slightly sensitive. If you are a gun enthusiast, you would need three things to be sure of the scope he is buying for himself; the range, the clarity, and the durability. This Bushnell AR Optics 4.5-18x 40 reviews will help you to find what you have been looking for because the product has all these features and more. Add competitive pricing to it, and you have a winner.